We’re starting again! The best time of the year – Thanksgiving! Such a wonderful holiday filled with the smells of warming cinnamon spices, the joyous laughter of friends and family, and The Dog Show. Really, it’s such a great day. And like always, I’m trying to prepare early. Rob came home yesterday from his deployment (yay! ), so he’ll be around for the Thankful festivities, and all the Turkey Day Trials that will ensue over the next 2 weeks. What a great husband – one of the first things he asked me after getting off the plane (literally, we are standing at baggage claim) was, “How are the Turkey Day Trials coming?” I think he enjoys this just as much as I do. For the big day, Rob will be contributing his now-famous-among-my-family mashed potatoes. No trials there. It is a dish with which not to be messed. As with pigs in a blanket, gin and tonics, and football, some Thanksgiving things are just expected, and Rob’s potatoes are one of them. Although we may have to make sure an extra pair of oven mitts is readily available. While cooking his welcome home dinner last night, I asked him to try a piece of tortellini, handing it to him with my fingers straight from the spoon out of the boiling pot. “Oh come on! You don’t have asbestos hands like me?” was thus my attempt at flirting involving boiling hot substances. Sad, I know. I put down the little round pasta. I’m so glad he’s home. But I digress. Even though the potatoes are perfection already, that doesn’t mean I can’t mess with other things. Like butternut squash, for example. 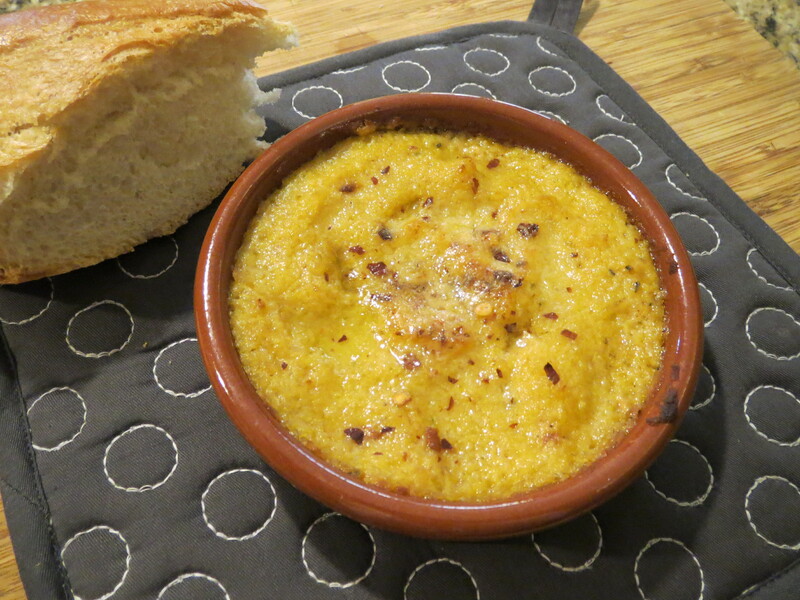 Butternut squash is fun, beautiful, funky (as in the cool hipster way, not the smelly way), simple and sweet. It is a favorite to salads, soups, and starchy roasted vegetable platters come this time of year. As an appetizer, I always make an Apple Bourbon Butternut Squash soup on the Day de Turkey, but thought I would experiment a bit this year. So with a big, sharp knife in hand, I dove in. Whether in soups, salads or just on its own sprinkled with a bit of sea salt and cardamom, my favorite way to prepare butternut squash is to roast it: diced smallish, high heat, olive oil, s&p, and often with an herb or spice. The caramelization of the squash’s natural sugars brings out a subtle sweetness similar to a rosé wine. Not at all over-powering, but leaves a touch of I-want-some-more-of-that on your tongue. Almost every time I entertain, I have a dip of some sort, really, because people love to dip things. And in some company, double-dipping is perfectly acceptable. 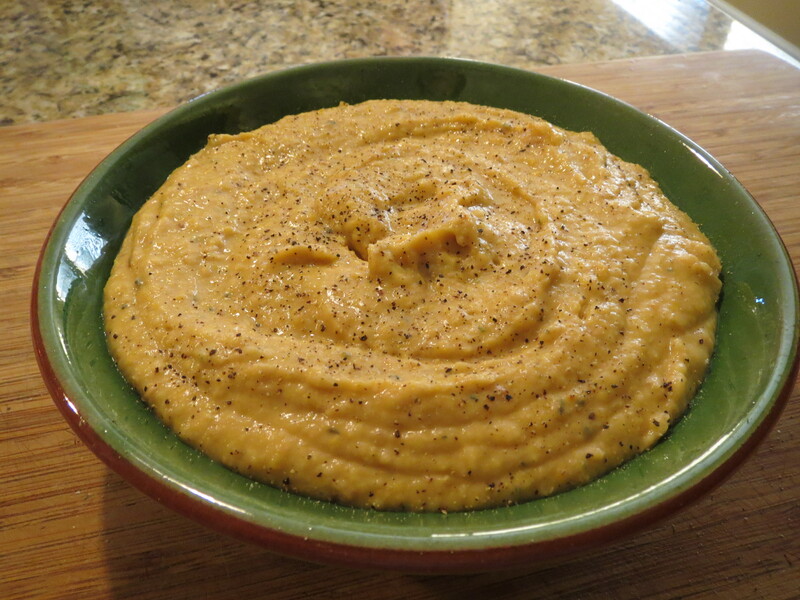 So my “go-to” is a lemony white bean dip that is much more subtle tasting than hummus, and as smooth as pate. It is always elegant, easy, and gone by the end of the evening. So as this Thanksgiving will be filled with wonderful entertaining, I thought of this dish, and the unexpected marrying of it and the butternut squash. Simply roasted, then puréed with the buttery white (cannellini) beans, with a touch of garlic, spice and rosemary, LOTS of olive oil, and voila: a new Thanksgiving appetizer. It’s perfectly fine just like this, especially still warm from the roasted squash, but I put some stilettoes on this dip and brought it to the next level. Spooning a bit of the dip into an ovenproof dish, I sprinkled over the top a bit of red pepper flakes, freshly grated parmesan regiano, and a drizzle of olive oil. After being under the broiler for about 3-4 minutes, the crusty, bubbly, golden crust is irresistible with some crusty French bread. I want some right now! Maybe I’ll slather some dip on a piece of thin, whole-grain toast, and fry and egg on top – the possibilities for this spread are endless! Turkey Day Trials are off to a good start! I’ll keep you posted with more to come! Enjoy the start to the season! Preheat the oven to 425 degrees. Taking the diced butternut squash, toss with the tbsp of olive oil, the rosemary sprig, and a 3-finger pinch of salt and freshly cracked pepper. After all the pieces are coated, spread the squash evenly on a baking sheet. The rosemary will crisp up in the oven, and add a great flavor. Place in oven for 10-15 minutes, turning the pieces once, until the top and bottom of the squash is a beautiful, dark golden color. 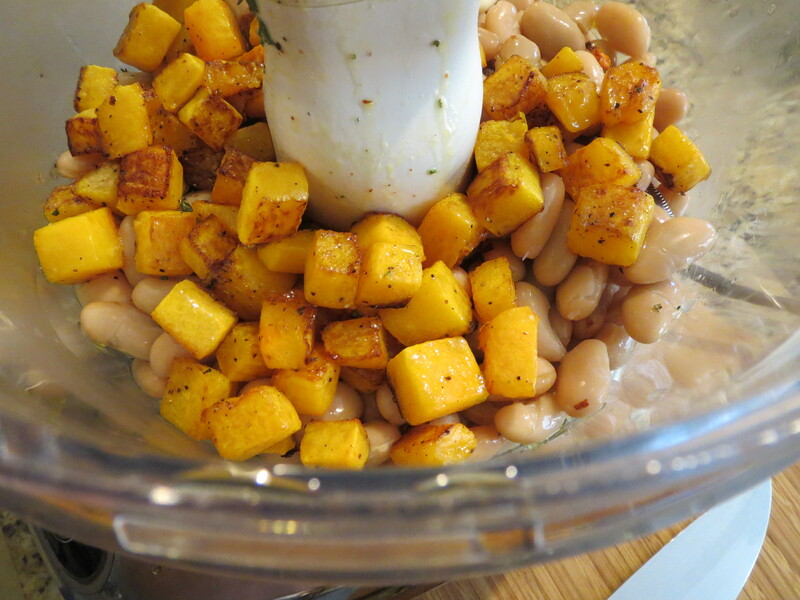 Then, pour the beans, the garlic clove, and a few tbsp of the extra virgin olive oil into a food processor. Pour in the squash, including the cooking oil, which has now been flavored by the squash and rosemary. Take the leaves off the rosemary (they will come off very easily and most likely crumble in your fingers), and add to the food processor. Add just a pinch of s&p, and pulse to get the mixture started. Then, while the processor is running, pour in a steady stream of the rest of the extra virgin olive oil. You’ll see the spread become creamy and very smooth. Taste for seasoning (I always find at the end, after adding all the olive oil, I need to add a bit more s&p). Enjoy with pita chips, crusty bread, or mixed vegetables. **To make the broiled spread: heat your broiler to high, spoon some of the dip into a ovenproof bowl, and sprinkle some red pepper flakes, good parmesan cheese, and olive oil on top. Broil until bubbly and golden. Goes GREAT with an earthy Pinot Noir, or bubbly Brut. Enjoy! WOW! I got brave & bought my FIRST butternut squash.